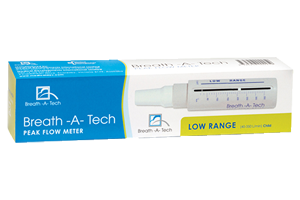 The Breath-A-Tech Peak Flow Meter is used to measure peak expiratory flow rate during exhalation. Measuring range: Up to 800 L/min. Designed to measure asthma symptoms to allow early treatment of asthma. Accurate, reliable and easy to use. Made from high grade material. Comes with a reusable mouthpiece that can be easily cleaned. Manufactured to meet International Standards for accuracy and repeatability (Australia and New Zealand). Includes daily recording card and colour coded stickers. Ensure the white pointer is at the L/MIN position and the mouthpiece is securely attached. When holding the Peak Flow Meter, ensure the slot faces upward and that you don’t disturb the movement of the pointer. Inhale a deep breath until your lungs are full. Holding the Peak Flow Meter horizontally, place the mouth piece in your mouth with the lips forming a tight seal. Blow out as hard and as fast as possible. Try to get all the air out of your chest within one second. Note the scale reading from the position reached by the raised line on the pointer, then return the pointer to the L/min position. Record the best of 3 readings. The Breath-A-Tech Peak Flow Meter is not to be used for diagnostic purposes or for fully evaluating patient respiratory function. Spitting or coughing may affect its function, particularly with small diameter mouthpieces. When taking measurement before and after using a pressurised metered dose inhaler, wait 10 minutes. Except for the mouthpiece, the Peak Flow Meter must not be dismantled as there are no serviceable components. The Breath-A-Tech Peak Flow Meter is used to measure peak expiratory flow rate during exhalation. Measuring range: Up to 350 L/min.